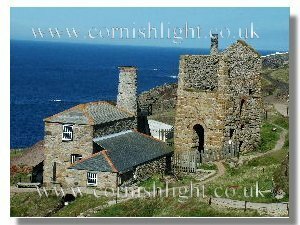 Keen walkers might like to follow the Coastal Path to nearby Botallack with its two engine houses perched on the cliffs. Whilst steam buffs will might enjoy a visit to East Pool to see the massive 90" Taylors shaft pumping engine. The life of a miner was a hard tough one barely able to make a subsistence living. Food would have been dried fish, bread and cheese. Often they would have to walk several miles to work each day. Many were tutworkers, paid on piecework for each fathom driven. Or tributers paid so much in the pound( actually so many shillings for each 20 shillings paid by the smelter) for the tonnage of ore they won. Prices were set at monthly intervals with miner bidding against miner. Miners were even expected to pay for their own candles, and explosive (note dynamite was not invented until 1867), tool sharpening and doctor. At its peak over 500 men worked at Levant. Over its lifetime it is estimated over 350,000 tons of copper bearing ore, and 56,000 tons of tin ore extracted. Ore content varied from 8% to 14%. Fatalities were common in the Cornish Mining Industry. Particularly terrible tragedy struck the mine on Monday 20th 1919 when the main connecting rod of the man engine broke and 31 men and boys lost their lives, most falling hundreds of fathoms to their death down the shaft. The man engine was a continuous rod with a series of 150 platforms, spaced at 12 feet intervals, To ascend and descend the mine a miner would jump on and off each moving platform as the rod reached the end of each stroke. The engine had a stroke rate of 5 per minute. A poignant contemporary account of the horrific events of 1919 can be read in the nearby Geevor Mine Heritage Centre. The mine winding engine that can be seen at Levant today is the oldest surviving mine engine in Cornwall. Built in 1840 to wind two skips up and down Skip Shaft at the rate of 400 feet per min. From Levant the ore would be transported by horse and cart, latterly traction engine) to Hayle or Portreath for transportation by ship to the smelters of South Wales. Skip Shaft is some 290 fathoms below sea level adit, nearly 2000 feet from surface level. It worked continuously from 1840 to 1930 when the mine was closed. Rescued from the grasp of the scrapman the engine eventually passed into the care of the National Trust. Restored to running order by members of the Trevithick Society (the Greasy Gang) during the years 1984 to 1992. Please check before travelling to see if "in steam". The sights sounds and smells are something so special.